So the April rankings have been released, and the Pots are sealed! One interesting thing to note is that Australia is 100% guaranteed an away trip to the Middle East -- although no games are played in Iraq, it appears that Iraq uses Tehran as a substitute homeground. Is Iran really that strong? 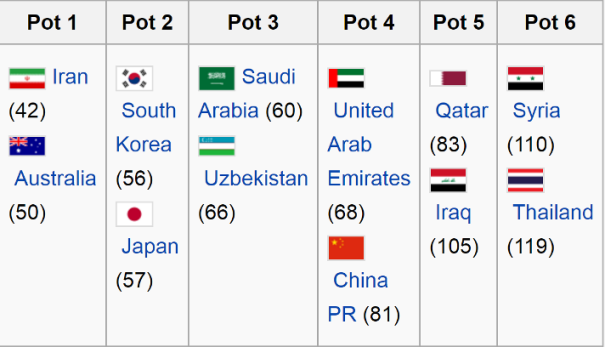 Another interesting point is that not everyone may agree that Iran is the strongest contender here - thus Australia's seeding into Pot 1 is sort of "wasted". Older Socceroos supporters will point to that tragic night in November 1997 where Iran came from 0-2 down in the second leg in Melbourne to win on away goals overall (3-3) as evidence that Iran are not to be trifled with. But younger Socceroos fans somehow have this expectation or fear that South Korea and Japan are the deadlier prospects and should be avoided over Iran - especially given relatively recent events and our rivalry with them over the years. As my friend Bob put it, South Korea and Japan just seem to be the more consistent opponents. I tend to favour the latter view, although I would by no means discount Iran. 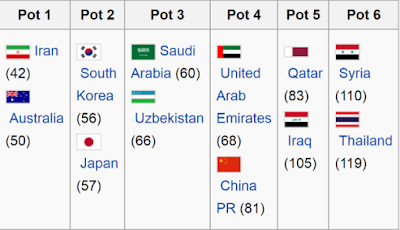 They certainly gave South Korea and Uzbekistan a tough time in the 2014 Qualifiers. Indeed, Iran boasts a fine World Cup qualification pedigree and have the experience to do it again. At the time of writing, according to the World Elo Rankings, South Korea is ranked 19th; Japan is 25th; Iran is 34th and Australia is 37th. In my previous post I said Japan were tougher opponents than South Korea. I am not so sure anymore. I have this preconceived idea that Japan are to be feared but, on their good day, South Korea could easily take at least 4 points over both home and away legs against Australia. Let us not forget that Australia did not beat South Korea at the 2015 Asian Cup in Normal Time. I want China and Thailand in our group, just for the kick of it. Saudi Arabia and United Arab Emirates are rather tough opponents and playing away to them will be a tricky task. Whatever the outcome of the draw, this qualification process will not be easy. The Group of Death is potentially Australia, South Korea, Saudi Arabia, UAE, Qatar and Thailand.